I completely ran out of fresh vegetables toward the end of last week, so this quick dish was inspired by what I did have, a can of artichoke hearts! I love artichoke hearts, but rarely eat them as I’m not a fan of anything canned, and I can’t seem to find ANY that don’t have some sort of nitrate or preservative (if you have found them, please let me know!!). I simply dropped a dollop of coconut oil in the sauté pan, then took each artichoke heart into my hand and squeezed it over the sink to eliminate the excess water, then dropped in the pan. I really think they’re best mashed up in your hand like this, as they don’t have to remain intact to taste good and then your sauté doesn’t get too watery. I let mine get a little toasty or caramelized, and they are SO GOOD! Last, I seasoned with kosher salt/pepp. 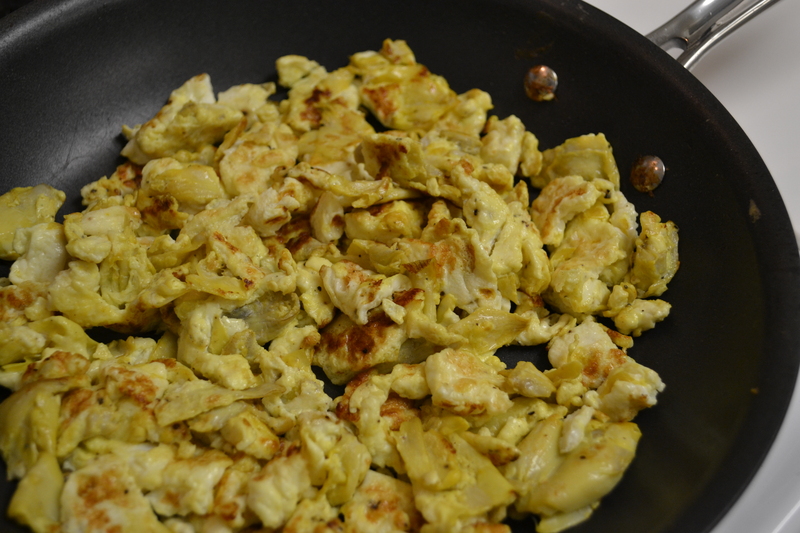 This would be a very easy and different side dish to any meal, and they really take on the texture and look of scrambled eggs. This entry was posted in Recipes and tagged Artichoke Hearts, health, Healthy Fat, Paleo, Side Dish, Tropical Traditions Coconut Oil by livinglikelinds. Bookmark the permalink. Looks sooo yummy!! And I know what you mean about the can, drives me nuts! Why can’t I just find some in water?! I thought trader joes carried some form of artichoke in a jar….. that may have been 10 years ago, though…. The ones I used were from TJ’s Debbie! 😦 Even the ones I’ve seen in jars, still have preservatives of some sort. Darn it! Monterey Farms make them in vacuum sealed packs with no preservatives! They have a couple of different types and they are delicious. Found them at Whole Foods in the cold section where they keep herbs, salad dressings, etc. Good luck!